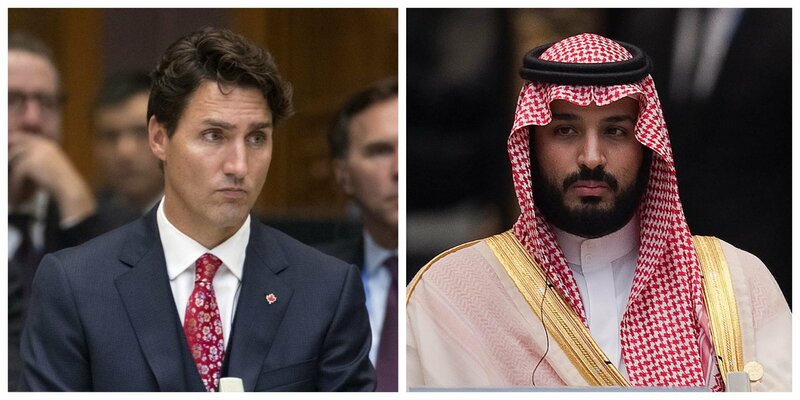 The war of words between the two countries stems back to a series of tweets from Canada's Foreign Ministry last week, when Ottawa expressed concern over arrested civil society activists in Saudi Arabia. Riyadh called the move a violation of its sovereignty and sought to impose a string of diplomatic sanctions against the North American country. In a tweet posted Friday, Canadian officials urged Riyadh to "immediately release" women's rights activists Samar Badawi and Nassima al-Sadah. Both campaigners were arrested in Saudi Arabia in late July, according to Human Rights Watch. Saudi Arabia's Foreign Ministry took exception to Canada's online plea, calling it a "grave and unacceptable violation of the kingdom's laws and procedures." Shortly afterwards, the Middle Eastern country announced punitive measures against Ottawa, including the expulsion of the Canadian ambassador.Some analysts say Saudi Arabia's move to sever diplomatic ties with Canada could be seen as both a power play for the kingdom's relatively young leader and a sign it is no longer willing to quietly ignore Western demands for political liberalization. Saudi Arabia's Crown Prince Mohammed bin Salman recently went on a global tour to promote economic reforms in the country and even championed the kingdom as the "next Europe," although global concerns about domestic human rights practices persist. What happened next? Saudi Arabia has placed a flurry of diplomatic sanctions against Canada. On Monday, the country recalled its ambassador to Canada for consultations and gave the Canadian ambassador 24 hours to leave the kingdom. The government also froze all new trade with Ottawa, ordered around 16,000 students in the North American country to either return home or complete their studies in another part of the world and canceled all direct flights to Toronto via its state airline. More recently, Saudi Arabia stopped all medical treatment programs in Canada and is coordinating for the transfer of all Saudi patients currently receiving care in Canadian hospitals to be moved outside of the country. And on Wednesday, the Saudi central bank and state pension funds ordered overseas asset managers to offload their Canadian equities, bonds and cash holdings "no matter the cost," the Financial Times reported, citing two unnamed sources. Saudi Foreign Minister Adel al-Jubeir threatened additional measures on Wednesday, telling reporters that mediation is not an option because the fault lies with Canada alone, Reuters reported.Despite the backlash, Canada doubled down over its push for Riyadh to immediately release arrested campaigners and activists. In her first public response to the dispute on Monday, Canada's Foreign Minister Chrystia Freeland said: "Canada will always stand up for human rights in Canada and around the world — and women's rights are human rights.